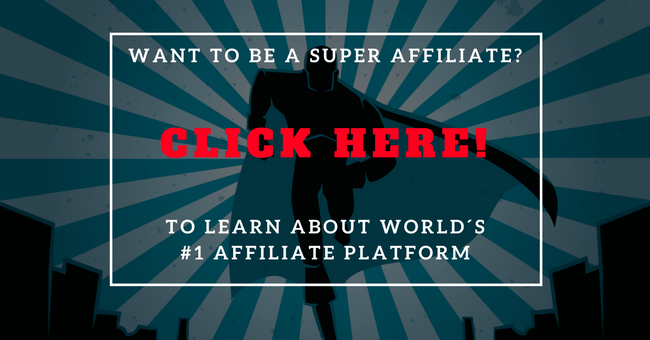 If you are interested in internet marketing, it is likely you have heard about WarriorPlus. 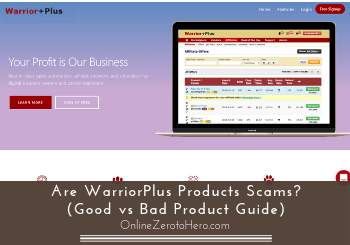 But is WarriorPlus a scam or can you find valuable products here both for yourself and to promote? I have been a member of the platform for a while and tested several products and kept an eye on the products promoted there. In this WarriorPlus review, I will share my experience and opinion about the products you can find there so it will be easy for you to find out if it is a place for you to look for products or a place to stay away from. In case, you do not already know, let’s just quickly go over what WarriorPlus is and what it offers. It was created in 2006 and is a marketplace and community where you can both sell your own digital products, you can promote other products as an affiliate, or you can buy products for yourself. It is specialized in digital products that are focused on tools and education for digital business owners and online marketers. Once you are a member, you can in the menu choose if you want to see the marketplace, the vendor options, or the affiliate options. The options you have on WarriorPlus. The marketplace is where you can buy the products that are for sale. The vendor option is if you have a product you would like to sell, and the affiliate option is if you would like to earn commissions by promoting some of the products that are for sale. The big question many people ask is, however, if any products on WarriorPlus are actually worth or if it is a scam platform. I know this was something I was wondering myself. So let’s look into this, so you know what you are getting into if you decide to sell, buy, or promote products from the platform. Let me just make it clear that WarriorPlus is not a scam. This does however not mean it will necessarily be worth using for you. But it is not a scam, and it would have been closed down a long time ago if it was. 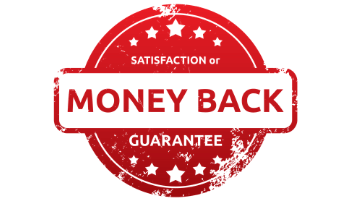 One thing that proves that it is legit is that any product you buy on the platform has a 30-day money-back guarantee. All products on WarriorPlus offer a money back guarantee. So if you do not find the product is living up to its claims, you can get a refund. I have used this option myself, and I know it works. You do however not request the refund with WarriorPlus but you have to do it directly with the vendor. But if you should end up not hearing from the vendor, you can contact the WarriorPlus support, and they will very likely help you as their reputation of course also depends on this. I, however, want to say that in my opinion there are A LOT of poor products for sale on WarriorPlus. So even though it is not a scam, there are in my opinion good reasons to be careful before buying or promoting anything from the platform. How to spot the good vs the bad products? I will be honest with you – in my opinion, the majority of products on WarriorPlus are overhyped and make a lot of exaggerated claims. It is important to mention that this is my own personal opinion. At the same time, I also know that there are some really great products for sale at times where you get really good value for your money. I have gotten some really great deals there myself, but I have also tried some extremely low-quality products. So how do you then know if it is a valuable product or just mostly hype? This is very important to know whether you are buying a product that is for sale on WarriorPlus or whether you are an affiliate and want to promote products. As a buyer, you, of course, want to make sure you are not wasting your money. Even though you can get a refund, you end up spending time on testing the program you buy, and you want to make sure it is worth the time. As an affiliate, what you promote will reflect on you and will affect the trust people have for you in the future. Personally, I, therefore, recommend doing what I call honest affiliate marketing, where you only promote products you truly recommend and think can help people. If you promote BS and crap, people will never trust you again and this can hurt your business in the long run even though it might give a quick sale here and now. At the same time, you can also sleep well at night if you focus on helping people and provide quality, which in my opinion is very important. There are mainly three ways you can spot the good from the bad products on WarriorPlus, and the methods are best if used together. A very important thing to look at when deciding if a product from WarriorPlus is worth buying or promoting is the sales page. You will find that many of the sales pages are focusing on claims about how easy it is to make money online and how fast you can do it. Often they will claim that you can start earning money in just hours if you use their system. Be careful about programs that promise super fast results with no effort. A sales page that is focused on how easy and fast it is to make money online is always something to be careful about. This is just NOT how internet marketing works. It will take time and dedication to build up a solid income. In a sense, the sales pages are not lying as they often show real case studies. They just forget to tell you that this is not how easy it will be when you first start out. The reason they can get results this fast is mostly because they for example already have a big list and people to promote their products for them. I, for example, at some point bought the program Blaze that claimed you can set everything up in just 45 min. This is, in theory, true, but not as a beginner. And the training I got definitely did not teach me anything else than very superficial info I could have found on mediocre blogs. So be careful about any page that is just focusing on how fast it is to earn. On the other hand, sales pages that focus on the learning aspect and what you will learn is a good first sign. You can, however, not only look at the sales page and know for sure. Some people that actually have good products just seem to get carried away about how a hyped sales page should be and end up making it overhyped, but in fact, the product has real value. So there are other things you need to look at as well. Before buying a product on WarriorPlus, it is always a good idea to look at the history of the vendor. Some launch a new product every month just to create hype and get people to promote the newest product. However, when launching products very often, the focus is rarely on quality but just on creating hype and generating sales. So if the vendor is launching products all the time, it is, in my experience and opinion, a big red flag. Also, if the vendor is known for high-quality products in the past or known for the opposite, this will also tell you something about the potential and risks of buying their newest product. Reviews of products can be a very helpful way to see what you can expect from a product. BUT be aware that not all online reviews are true. There are unfortunately many affiliate marketers that are willing to make a very positive review just to earn commissions but without ever having tried the actual product. Often the vendors are even reviewing each other’s products and just promoting each other’s poor quality products just to help each other out. That is unfortunately also the reality of affiliate marketing. But luckily not all reviews are like that. There are many affiliate marketers that only focus on quality and only promote what is really worth promoting. In my experience, if you see a review that is basically just repeating the sales page and repeating the arguments on the sales page, it is very often a person just trying to promote. Also, look at the reviews that person has created before. If the same person only creates 5-star reviews and create several of them every week, it is a sign he/she is just trying to promote whatever pays them a commission. People that only do overly positive reviews is something to be careful about. So look for balance in the reviews to see if you can trust them. And be aware that there are some great products out there – also on WarriorPlus. But there are not that many, so if someone only has overly positive reviews and has a lot of them, it is a red flag. Unfortunately, there are still many marketers like this, so be aware of this. What to do if you feel cheated? If you use the 3 methods above in combination with each other, you have a good chance to spot if it will be a WarriorPlus product worth investing in and testing out. If I see too many red flags, I just simply stay away, and I also create quite a lot of reviews that show these red flags to help make people aware of the tricks that are often used to sell make-money-online programs. In case, you still end up getting a WarriorPlus product and feel cheated and feel it does not live up to its claims, it is luckily possible to get your money-back. So in that sense, there is not much of financial risk in testing a product if you are not sure about it. Of course, you can end up wasting a lot of time which is also a problem, but the money you can get back. When you buy a product on WarriorPlus, you get a confirmation email. Here you will get contact info for the vendor. You can see who to contact for a refund in your confirmation email. This is where you need to write if you want a refund. You should not write WarriorPlus directly. And then remember the name of the vendor – I know the names of several vendors I will stay far away from because of the history of their products and what, in my opinion, is low quality. Of course, people can improve and might create a better product next time. But in many cases, the people that are spitting out one product after another do not really care about quality so just remember their names and stay away from their products in the future. WarriorPlus has both advantages and disadvantages, in my opinion. You cannot as such say any of the products are scams. In my opinion, many products are very low quality and promise too much on the sales pages. But quality can, of course, be discussed and is subjective. It is important to make it clear that WarriorPlus is NOT a scam, and you can find some really high-quality products here. The good products usually also give very good value for money. All of them will have upsells after you join, but some of them can really be worth it. If the basic product is high quality, the upgrades most likely will also be. And if the basic product is low quality, the upgrades most likely will also be. So I hope this article has helped you find out more about what you can expect from products sold on WarriorPlus and how to spot the good vs the bad options. If you have any comments, questions, or have any experiences either as a buyer, vendor, or an affiliate of WarriorPlus, I would love to hear from you in a comment below.